The 90H-V ECM HRV heat recovery ventilator incorporates extremely high performance motors, equivalent, in power consumption, to a compact fluorescent bulb (13.5 watts each), This significantly lowers energy costs while affecting their high performance. In addition, the advanced heat recovery core recovers up to 80% of the heat energy from the outgoing stale air and transfers it back to the incoming fresh air, reducing your home heating costs. Ideal for small to mid-sized homes*, this balanced system offers superior indoor air quality and excess humidity control. 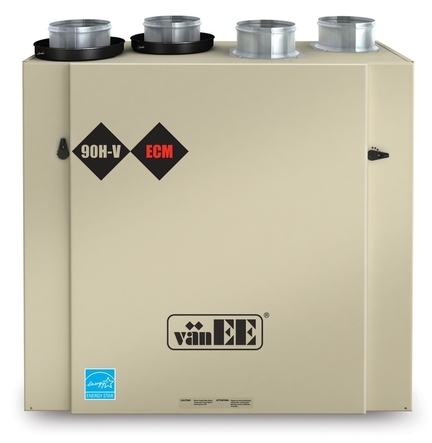 When combined with the state-of-the-art programmable PLATINUM wall control, the 90H-V ECM HRV surpasses energy-saving standards while providing effective heat recovery and ventilation.